The Large Hoof Carvings at the archaeological site at Pansaimal. These stones were carved when the Stone Age man was still leading a hunter's life and the animal life around him fascinated him expressing his imagination. A series of concentric circles possibly a primitive means of measuring time. 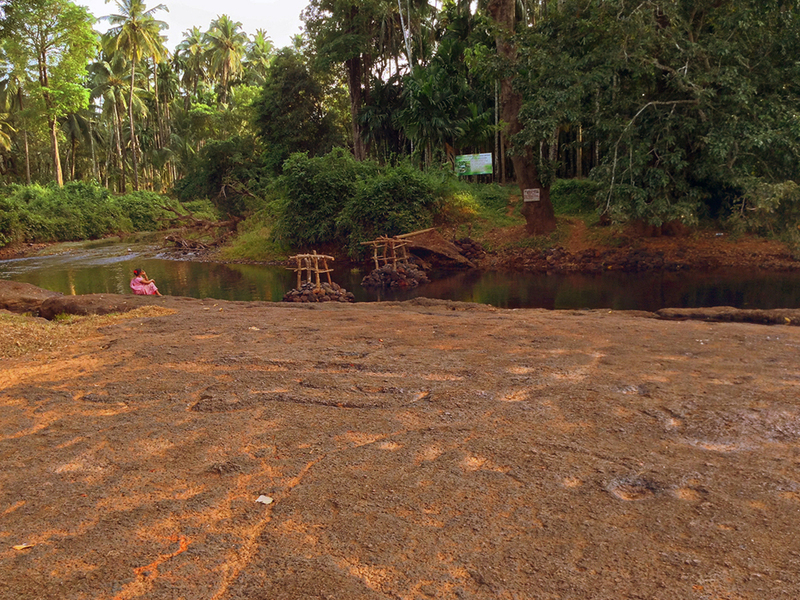 There is no entrance fee to this place though there is a full-time caretaker who also guides the tourists. 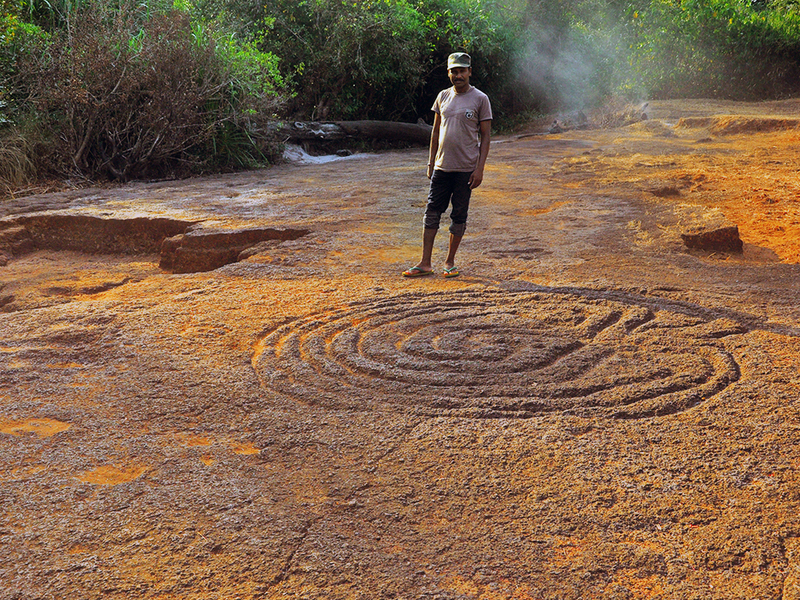 There are many spiral symbols carved by the Stone Age man which depict his understanding of the geometrical shapes such as labyrinth. The labyrinth symbol has been found all over the world. 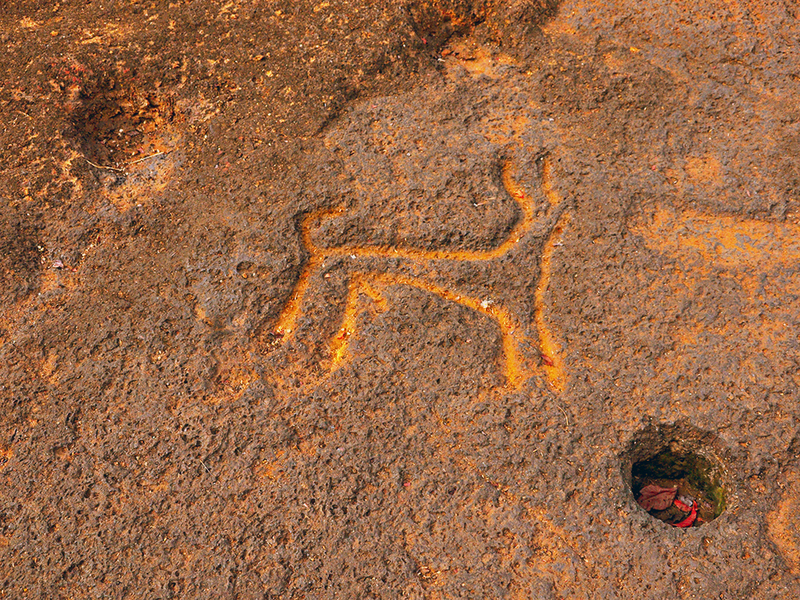 The hunter dog carved in laterite, the engravings were carved using specially prepared sharp-pointed stone tools. 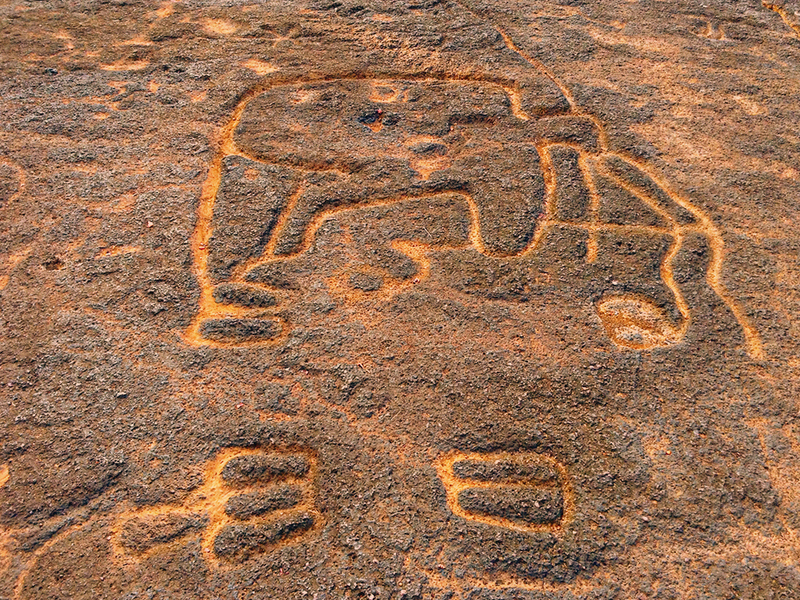 The rock art at Pansaimal is full of carvings depicting symbols of the religious cult, cosmology and bull fights. These carving at Pansaimal require more attention and the maintenance. Since the carvings are open to the sky, uttermost care needs to be taken for protecting them. There are also chances of damaging the carvings due to the river flood and walking over them. 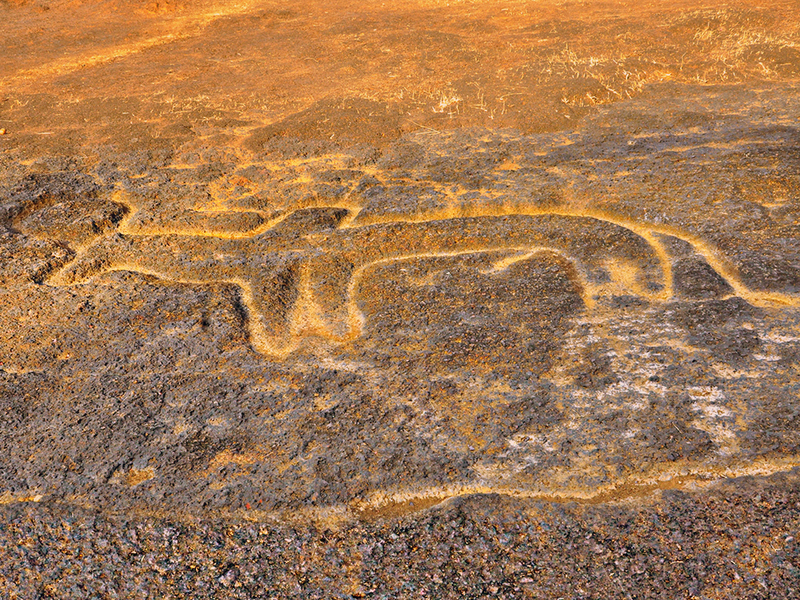 The force in the animal figure depicts the sharp observation of Stone Age man in his petroglyph of Indian bison in laterite stone. Symbolic depictions as well as anthropomorphic figures not only show his imaginative mind but also indicate the remote ancientness of the carving, many of which are comparable to those in Europe, America and Africa. 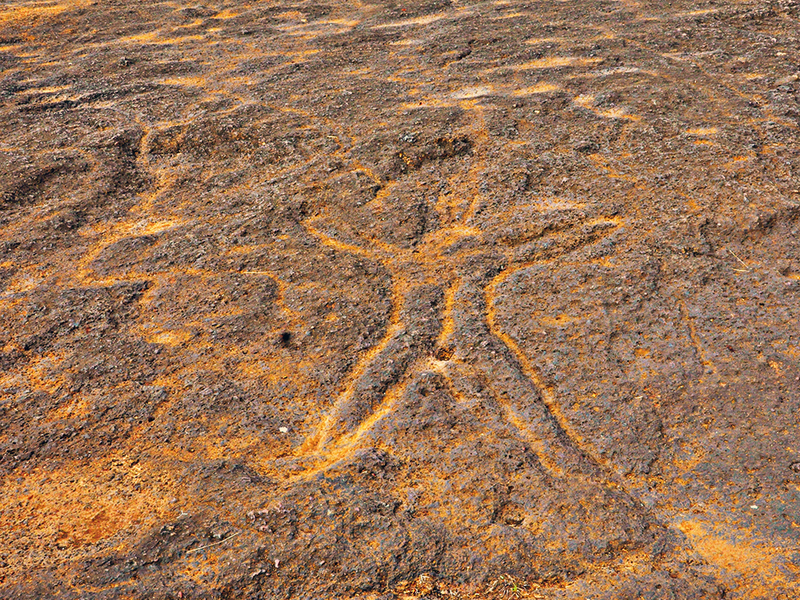 For example, Petroglyph of Mother Goddess carved in laterite. 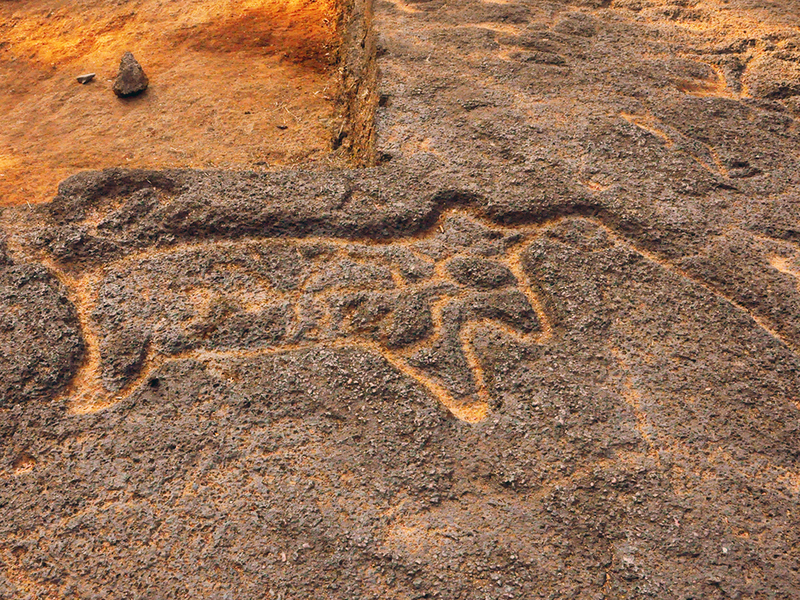 The bull engraved in laterite. The engraving is not much deep carved into the rock. The carvings are exquisite in nature and it is truly astonishing the way is has been preserved. The Stone Age man carved hunting scene, animals running around, X-ray type of animals, harpoons shows his interest in animal hunting. The large Hoof Carvings. The Stone Age man tried to understand the seasonal changes, movements of the Sun and Moon and attempted to evolve his own calendars which we can see in the carving in the form of triskelion and the moon calendar. The mysterious carvings are located at the bend in west-flowing river Kushawati outside the Pansaimal village, accessible via a winding pathway. Each Indian monument is a remarkably excellent sample of unbelievable artistry, covering a sense of mystery and deception. Such monuments of India have become an inspiration for the future generations. 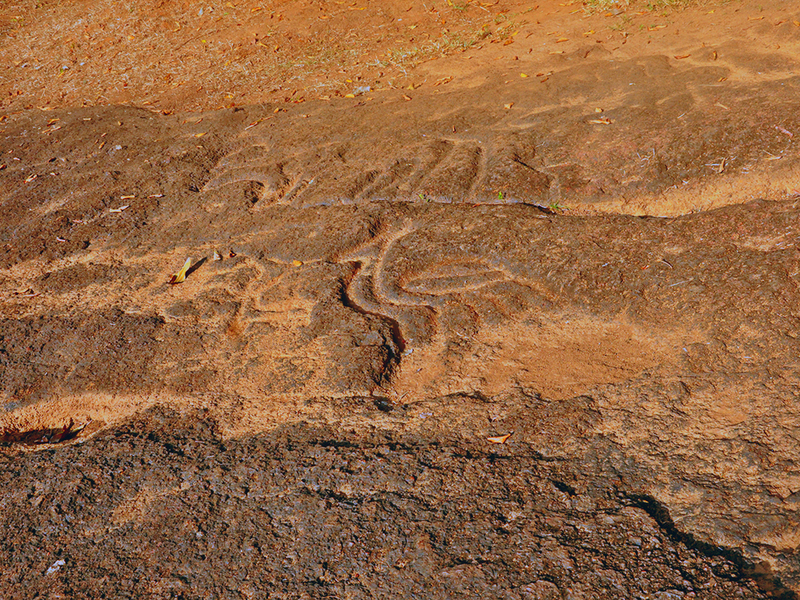 Stone Age carving on laterite at Pansaimal, it is situated outside of the village to a bend in the river Kushawati. Goa is evident the master craftsmanship and elegance, that brings to the forefront the splendour of the bygone era. 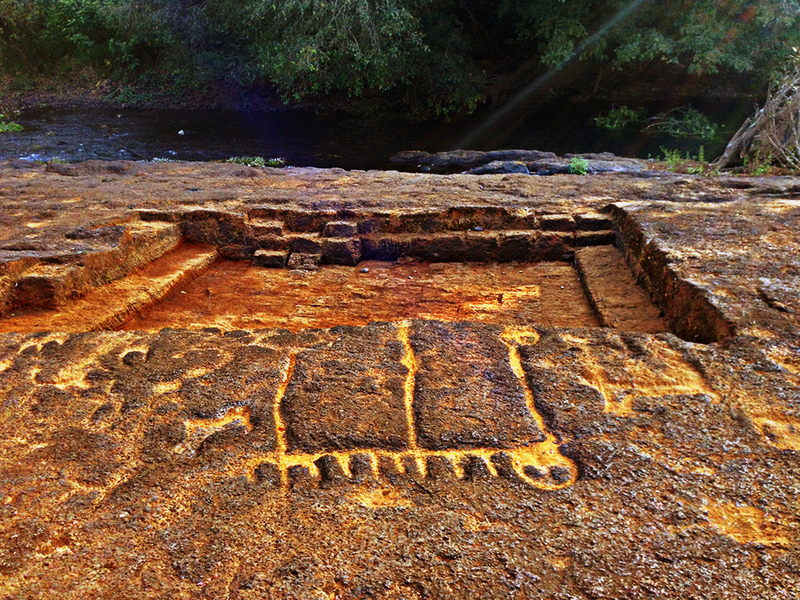 The mystical rock carvings were discovered on 8th May 1993 by the villagers of Pansaimal which is also referred as Usgalimal, it is situated at about 75kms from Panjim and 16kms south from Rivona in the Sanguem taluka in south Goa. 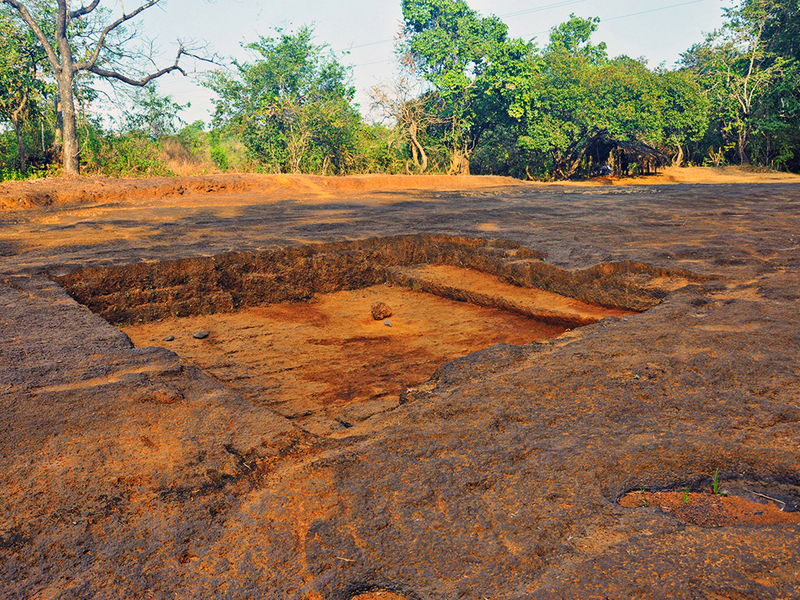 The site is hidden behind an old iron mine, one can easily get to the carvings as a board has been erected by the ASI along the roadside for advertisement. 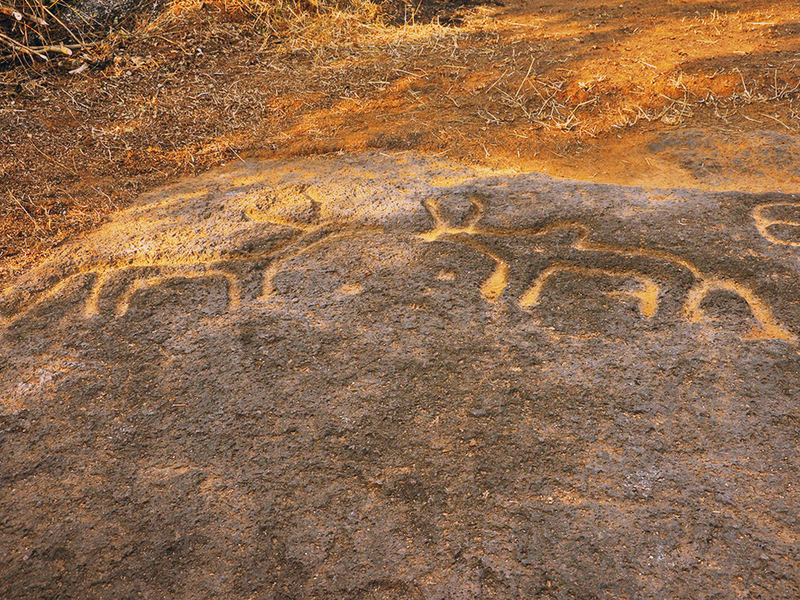 These rock carvings are now one of the most important prehistoric sites in western India as they are thought to date between circa 8000BC - 2500BC from the Upper Palaeolithic period. 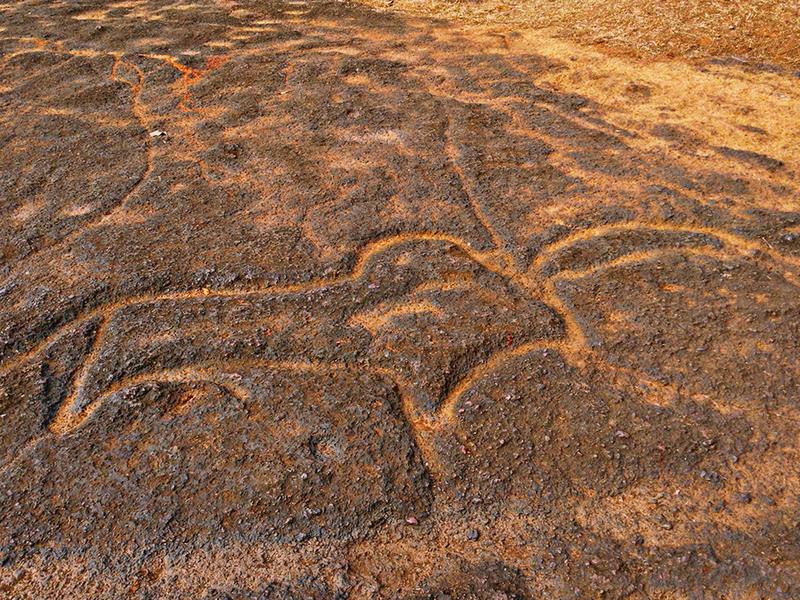 The rock has a carving of around one hundred distinct figures, which included images of bulls, symbols, spirals, implements, lines, human figures, goddess, fish, deer, antelope, a dancing woman, a peacock and triskelions – A figure consisting of three stylized human arms or legs radiating from a centre and a series of concentric circles thought by some archaeologists to have been a primitive means of measuring time. The area covers approximately 60 x 30 sq. metres carved on a bed of laterite. The images in this module document a few examples of the exquisite stone carvings found at one of the beautiful villages of Goa.